KKVK what? It is the name of a blogging event held over by French blogger. Originally created by Manue, it is held this month by Ninnie of Mitaine Ecarlate. The theme this month was cheesecake. 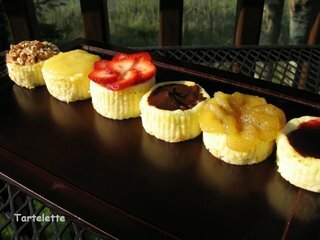 I decided to go with individual cheesecakes because I could not decide on one flavor. There were too many I wanted to bake! The KKVKVK is a fun game in which a theme is chosen for the month and awards given to the most tempting, good looking, downright good desserts. As with any blogging game, the interest (at least for me) lies in the joy of making something with the theme or ingredient given. I was really turned on by this month theme, cheesecakes. Since I discovered this delicacy I cannot stop coming up with new flavors and twists on such a classic. At the restaurant I have an awesome basic recipe which allows me to change the fillings at will and come up with great stuff, like an upside down pinneaple cheesecake or a Tarte Tatin version. But this time, I could not make up my mind. Anybody who knows us would tell you that is no news (which explains why we can never decide on a restaurant and always end up with me at the stove, but that is another post). There were only a few solution to my dilemna: bake 6 different cheesecakes and use one slice of each to make a sampler type cheesecake or make individual one with different flavors or toppings. I opted for the latter. Knowing that the batter would rise but fall upon cooling, I decided to leave them plain for the baking phase and top these ugly (really) yummy craters with various flavors: from left to right: homemade pecan praline, homemade lemon curd, fresh strawberries, chocolate ganache, honey roasted banana, homemade blackberry jelly. Individual cheesecakes are great when you have a dinner party planned , an end of the summer picnic, or friends who know it's 5 o'clock and you will certainly have something coming out of the oven. Here is the recipe for the plain ones, be creative with the toppings. Don't worry so much about the fillings because these shrink and sink after they come out of the oven, and you will be more preoccupied about "fixing them pretty", as S. says. Lime a 12 cavity muffin tin with cupcake liners. Place 1 vanilla wafer in the bottom of each. Cream together the cream cheese and sugar, add eggs, one at a time and vanilla. Fill muffin tins 3/4 way full. Bake at 350 for 15 minutes. Let cool completely before removing paper liners. Have fun with the toppings! Bon voila pour les ricains, maintenant pour les froggies. Pour toutes celles/ tous ceux d'entre vous qui viennent sur mon site pour la premiere fois, "Bienvenue". 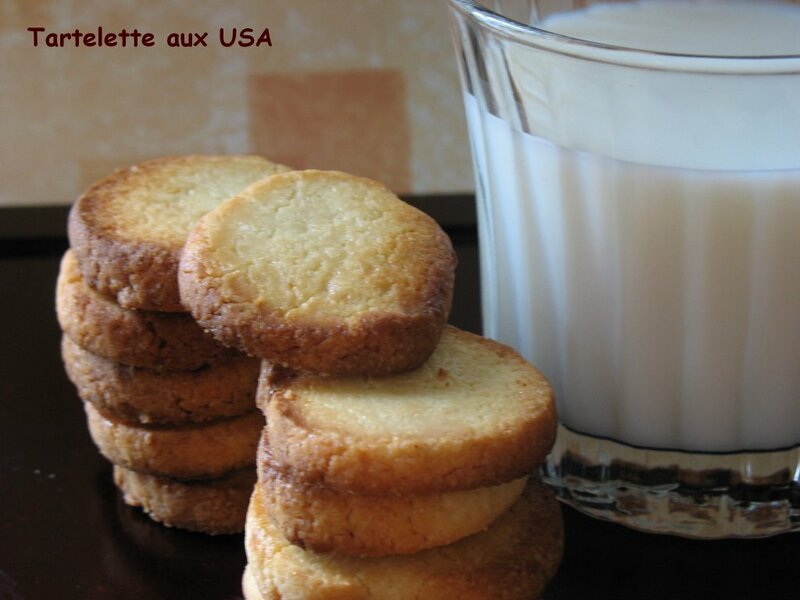 J'habite aux USA depuis 10 ans maintenant, mariee a un Americain depuis 8 ans, et je sympathise bien avec Estelle quand on lui pose la question "how do you like it here?". 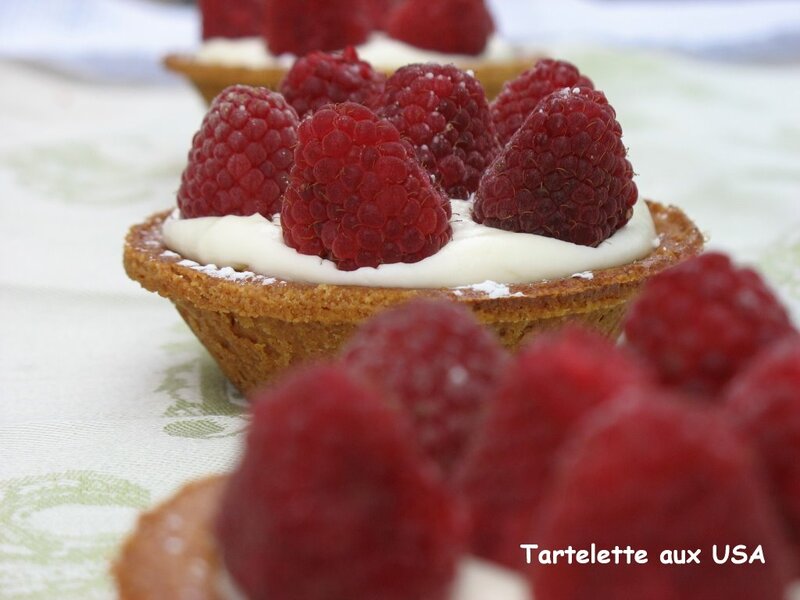 Ce blog, Tartelette, c'est pour me faire plaisir. 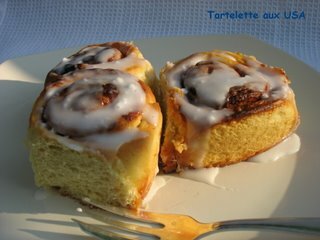 Je fais de la patisserie professionellement et j'en fais encore durant mes jours de conge. Et oui, je suis tombee dans le chaudron quand j'etais petite! J'adore la patisserie, et puisqu'on est que 2, les voisins en profite, les copines et tous ceux qui m'entourent. 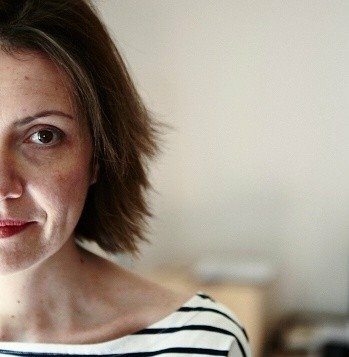 J'adore aller lire les blogs francais car ils me permettent de garder un lien avec mon patrimoine, que je me vois de plus en plus revendiquer plus mon temps ici s'allonge, bizarre comme la nostalgie vient nous envahir! Je vous lis regulierement mesdames/messieurs meme si je ne mets pas forcement de commentaires. 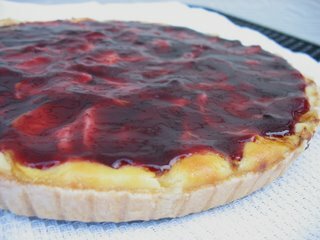 Depuis que je vois ce petit jeu du KKVKVK, je me dis que ej dois bien finir par me bouger ety participer, et quand j'ai vu le theme des cheesecakes, je me suis dit "yippy! J'en fais tout le temps, j'adore et j'ai des millions d'idees! "Nature, chocolat, noix, caramel, fruits, dessus, dessous, dedans, dehors, Tatin ou pas, le cheesecake se prete a desd myriades d'interpretations. Et la croute! N'oublions pas les 31 facons de faire la croute! 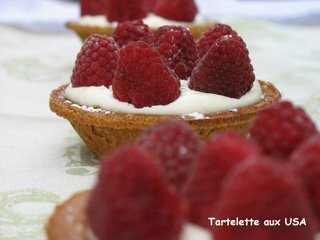 J'ai gamberge comme une deratee et je me suis enfin decide a faire des petits cheesecakes individuels car je pouvais ainsi les couvrir avec les ingredients que j'avais sous la main.Voila ma recette, adaptee de Gourmet Magazine. Dans le bol d'un mixer electrique melangez le cream cheese et le sucre. 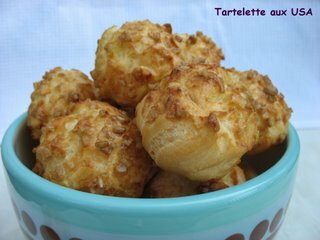 Ajoutez les oeufs et la vanille et melangez bien mais pas trop longtemps pour ne pas incorporer trop d'air. Prepare des moules a muffins, en mettant des caissettes en papier dans chaque emplacement, mettez un biscuit dans le fond de chaque caissette et repartir l'appareil a cheesecake sur chaque biscuits. Faire cuire a 189 degree celsius pendant 20 minutes environ et laisser refroidir avant de demouler. J'ai chapaute les miens avec (de gauche a droite): praline au noix de pecan, lemon curd, fraises fraiches, ganache au chocolat, tranches de banane roties au miel, et confiture de mure. Et voila! Ma premiere participation, et je l'espere pas la derniere! A bientot de vous lire et de vous rencontrer peut etre un jour! No, I did not start a construction business! I am just regressing in pure childhood memories and tastes. It must be the end of the summer that makes me nostalgic and longing for homely desserts. This season flew by. 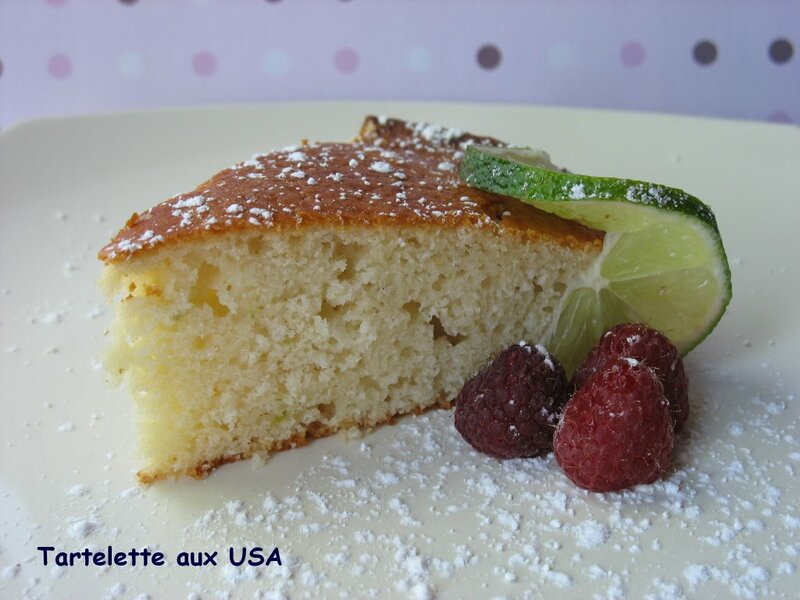 The particular name of this cake is the "Quatre Quarts". Each major component, butter, flour, eggs, sugar have to weigh the same and all four equal parts come together to make a whole of goodness. It is lighter than the American pound cake although the one my mom used to get at the store was close to an etouffe chretien, something so dense it could have "choked a Christian". 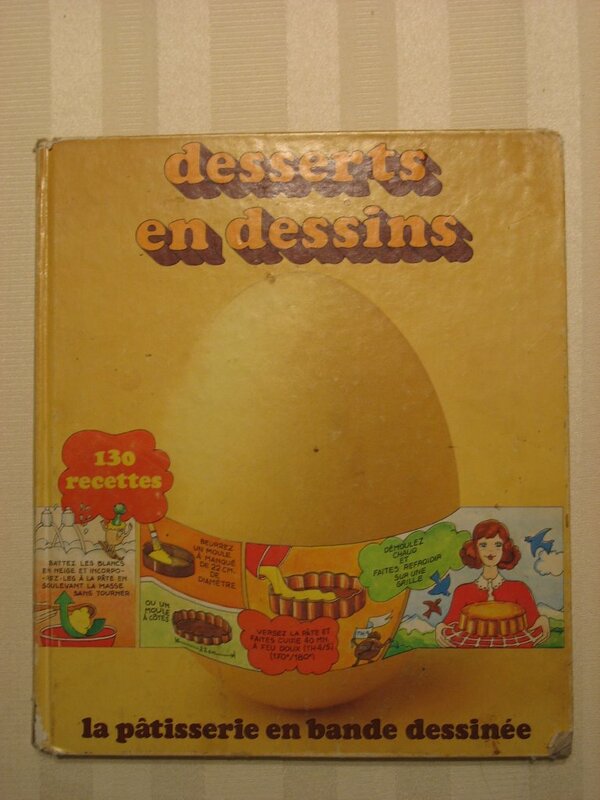 Here is the recipe from the book "Desserts en Dessins, la patisserie en bande dessinee"
In a bowl, cream together the butter and sugar, add the eggs one at a time, and mix until the whole thing is pale white and very creamy. Add the flour and baking powder. Mix thoroughly. Pour into a 9 inch baking pan and bake at 350 degrees for about 40-45 minutes. Note: add a tsp vanilla, or other flavoring of your choice. That day, I used coconut extract to celebrate summer. Even my husband could make that! Yeah well, he probably does not because the kitchen is my terf! Yesterday was just the kind of sundays we need once in a while. We got up late, had brunch, worked in the yard went to the movies and tried a new tapas restaurant. Needless to say I stayed in my pjs as long as I could...just because I could! I took the time to read a lot of blogs, but on the weekend, when my brain is more at ease I really enjoy reading French blogs. I revel in the words, the phrasings. I laugh at expressions and idioms I have not heard in a while. I make notes of new ones. 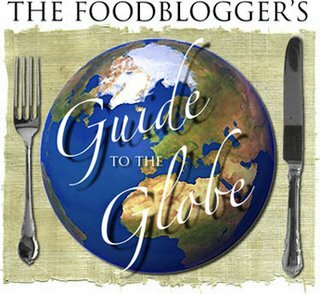 I feel these blogs keep me up to date with what's going on in the food world over there, the latest food trends, restaurants, chefs, etc... but it is also a way for me to claim my territory, to expand people's taste around me. Some blogs out there are also an inspiration for me to broaden my cooking horizons. I mostly blog about pastries and desserts but the world of bloggers inspire my daily to cook meals with an Asian, Australian, Russian, Italian, Spanish, German flair. 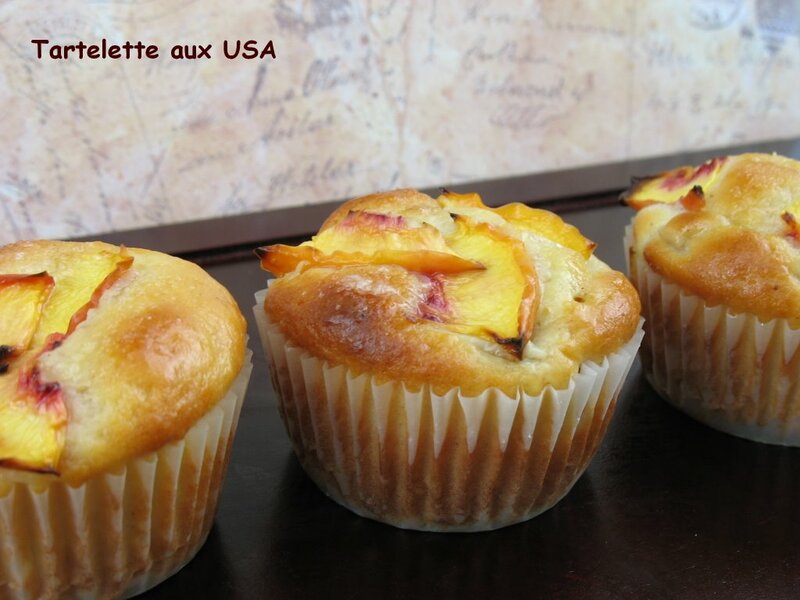 French bloggers like to expand their own horizons also and cook some American influenced meals and pastries. 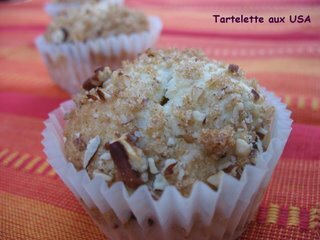 I found this particular recipe on one of my favorite blogs, Eggs & Mouillettes. A "mouillette" is a thin stick of bread that people use to dunk into their soft boiled egg. A bread fry if you want. I like this recipe because it comes together in a pinch and can be easily adapted to any combination of fruit and spices. Once you have the base, the rest is really up to your imagination! Preheat oven to 360 degrees. In a bowl, combine the eggs, milk, yogurt, oil and vanilla. Add the brown sugar and mix well. Dice 3 peaches, and cut one in thin slices that you will use to decorate the top. Together, sift the flour, baking pwder, baking soda, salt, cinnamon. Add to the wet ingredients and add the peaches. Don't overmix, it's ok if it looks a little lumpy. Pour into muffin tins and bake for 20 minutes. I added a Tb. of wite sugar on top of each prior to baking to add a little caramelizing action. These were easy, delicious and made good use of fine local Southern peaches. What a cool project! Melissa at The Traveler's Lunch Box found this list published by the BBC of 50 things one should/must eat before they die. It was fun to pick out the things I had not tried yet: Moreton Bay bugs, kangaroo, reindeer, guinea pigs, barramundi, haggis. 44 out of 50. I don't know about you but I don't feel bad about the bugs. - Morrocan Couscous: I am not talking about the pasta itself but about the whole stew, filled with lamb, merguez, chciken, turnips, chickpeas and enhanced with harissa. My grandparents were stationned in Morroco during WWII and my grandmother learned how to make a mean one! - Vacherin: I remember quite many parties around this cheese! Kinda like having a fondue but way much better when you get to sit and eat the original. Vacherin is rare and out of this world! - Cassoulet: This specialty of the south west fo France is to die for. Dive into pure buttery meats bite after bite. You can find many great cassoulet around the Toulouse area but I have to tell that the one they make around Carcassone rocks! 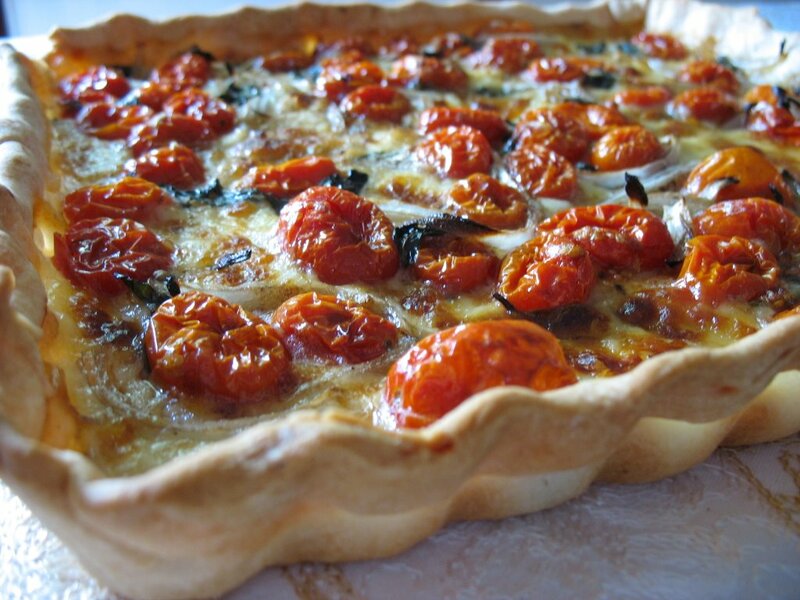 -Flamekuche: not quite a pizza, not quite a tart, it is definetely a pie of its own. The best I have had were in Belgium and Belgian cafes in France. Creme fraiche, bacon (lardons), onions, rich, buttery, crusty all washed down with a good beer and it is heaven. - Calissons d' Aix: I used to find them allright when I was a kid, (it was more about the sugar high than anything else) but as I grew older my mouth finally discovered and understood all the intricate flavors of this almond confection. I remember sneaking into my parents' bedroom to find the box and eating a couple on their balcony looking right at Cezanne's Mont Sainte Victoire. I hold them dear to my heart because they remind me of my childhood but also because they make excellent components for ice cream and other desserts. So here is my list. What are your 5 things ? When I spot a yummy thing I just have to try it and when I read about these I immediately thought of the perfect snack bar to have around the house at the end of the summer. Blogger has been playing tricks with me since last night so I am going to leave you with a "devinette". The game is to guess which other blogger provided this recipe and what it is. I will come by this afternoon for a real post. If you recognize your dessert, please don't say a word. There will be a goodie for the winner. Well, since nobody wants to play the game ... I am just going to continue with the post. The answer was Peanut Butter and Jelly Bars. I don't know if it is because of my European background but I am not a big fan of peanut butter. Well, let me rephrase that, I am not a big fan of peanut butter straight out of the jar and I'd rather have it in a cookie or a confection. 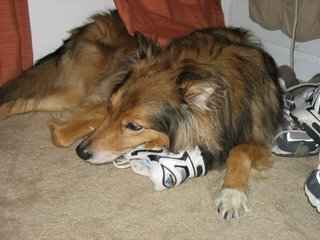 On the other hand, Mr. B. really does not care what form it takes as long ther is some around the house! These bars were made yesterday and as of today they are gone. No, we did not eat the whole pan! 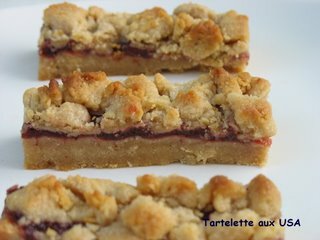 My friend S. called with an emergency: she needed to bring a cookie bar type snack for a potluck and the girl can't cook to save her life. Could I help? "Well, let me cut some and take a picture and there, you can have the rest." I saved the sample and now I have got to make another batch tomorrow or Mr. B. will never let her step foot in the house again. The sounds coming out of our mouths were something like "Hmmm...wahhh...dang...hmmm", you get the picture. 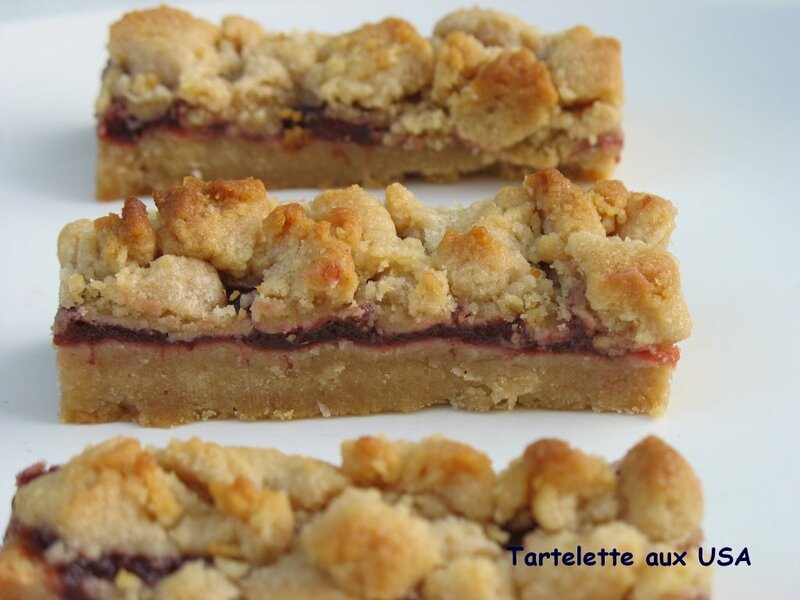 Now for the reveal: you can find the recipe for Mary on her fantastic blog Alpine Berry, here. Thank you dear for such a good recipe. I am not the one saying this but over 400 people at Marmiton, a French recipe site much like the Food Network TV one. Now that's some feedback. We were invited to Sunday night supper and a game of Scrabble at my in-laws with T & D, and somehow the prospect of leftover banana pudding for dessert did not appeal to me. Being the dessert freak that I am, I volunteered to bring something. I must be completely hormonal or seasonal, but I am craving lemons again, and I wanted to try something different. The last time I made Lemon Meringue Pie, I was probably 12 or 14 and I remember vividly looking at a gorgeous picture in one of my mother's magazine. It was my first attempt at meringue on a pie, and if I remember correctly, I did a fair job. I had forgotten how comforting Lemon Meringue Pie can be. 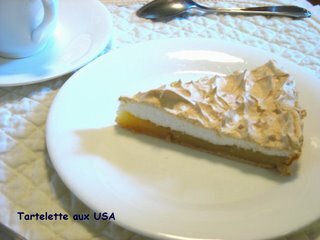 This particular recipe gives a very tangy filling, a not too sweet meringue in a nice shortcrust bottom. Perfect to mark the end of summer (although here it is year round, but we like to pretend we have seasons). In a bowl, mix the egg yolks and the sugar until pale, add 2 Tb. water. In a separate bowl, mix te flour and butter until ressembles coarse crumbs. Add the egg/sugar batter and mix quickly until the dough forms into a soft ball. Add a couple extra Tbs. water if necessary while you incorporate the ingredients. Refrigerate 30 minutes, roll the dough out and fit it into 10 or 12 inch pie plate. Prick with a fork, cover with foil and pie weights (I use dry beans) and cook at 350 until the dough is completely cooked through. Mix sugar and eggs into a bowl, add the cornstarch and mix well.. In a saucepan, heat up the lemon juice and zest. When it is hot, slowly pour over the eggs and sugar to temper them and return to the saucepan, let it thicken over low heat, stirring constantly until the consistency is like mayonnaise. Pour into the cooled pie crust and refrigerate. With an electric miser, beat the egg whites to a foam, slowly incorporate the sugar and baking powder, one Tb. at a time, until the egg whites are stiff. Arrange the meringue on top of the lemon filling and bake at 290 for about 30 minutes. So good, light and tart. My kind of comfort food. Well, it's about time a blogging pastry chef decides to participate in this great event better known as SHF. I was inspired by its very own creator, the Domestic Goddess, to start a blog but always seemed to miss the call for entries deadline. Not this time! The theme this month is "Can You Can? ", and is hosted by Nicky at Delicious Days. I've always felt inspired by the other SHF themes because they often pushed me to look at an ingredient in a different manner or to open a cookbook I had forgotten was on my bookshelves or even to come up with something completely ad lib. 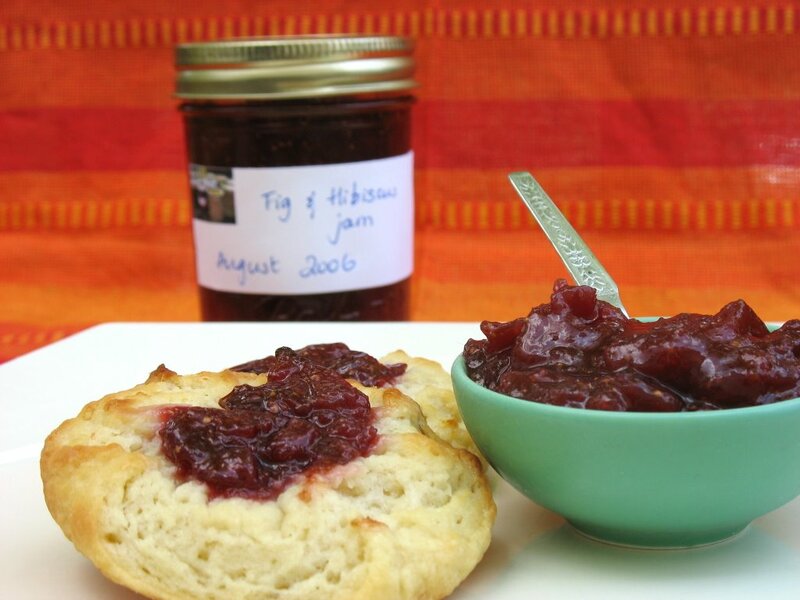 I never thought of jam as anything other than a topping, a common ingredient for breakfast. I make jams and preserves on a regular basis but they only seem to be either topping our sunday scones or being given away to friends or family. Since I make danishes about every weekend and use diffrent kinds of fillings or toppings, I thought I could use some of my recently made Fig and Hibiscus Jam. A few years ago, Mr. B brought back from a trip to Egypt a pack of loose Hibiscus tea leaves and we have become in love with the slightly tart taste and flowery fragrance. I had promised Danielle at Habeas Brulee a jar of Fig and Lemongrass jam but decided for hibiscus instead. After browsing online I finally decided upon this recipe for the jam. I cut the figs, mixed them up with the sugar and put a hibiscus tea bag in the pot and let it steep overnight. The result is incredibly fragrant and light. The danish were wonderful with it. You can find the recipe for the danishes in a previous post, and the recipe for the fig jam here. The best part about this jam? It was great to use as a filling for some rose macarons I made yesterday! But that's another post. I am taking another poll though. I am thinking of dropping the "aux USA" (in USA) for a more casual "Tartelette" as a blog title. What do you think? 8/23/06 Update: I have to add that the labels are made out of a picture of the jams I made a couple months back, printed on cardstock and glued on the jars. ...like this is not too bad according to Mr. B and the neighbors. The recipe for the Cinnamon Rolls makes 2 pans so I took some to the 2 houses next door. I make these about every weekend and I always forget to take a picture before they are all gone. They are that good! I had already posted the recipe a while back without pictures here, so no need to repeat (plus I have issues with my copy/paste right now). On another note: as you can see, I have changed the template of my blog and I still hesitate between the 2 so I am taking votes (for the very readers that I have). Which one to keep? No, this is not the name of another pastry but the name of my new niece, born on August 14th. She does not look anything like a wrinkly banana, but she sure is cute as a muffin. So these are for you little one. I got the recipe from Cooking Light for their banana bread and baked these in muffin tins, added some brown sugar and chopped pecans to the tops and voila. Chou who? Chouquettes I tell you. Little rounds of Choux Pastry, crisp on the outside and moist on the inside. In France they are a common afternoon snacks and mom used to buy them fresh at the bakery quite often since they were the only pastries my brother enjoyed eating. There was never enough of them! Mr. B asked me to make something typically French that he could take to his students for their last day of class and I thought these were the perfect ambassadors. Choux are at the base of many a French specialties: Paris Brest, Religieuse, Saint Honore, Piece Montee (traditional wedding cake), Gougeres. 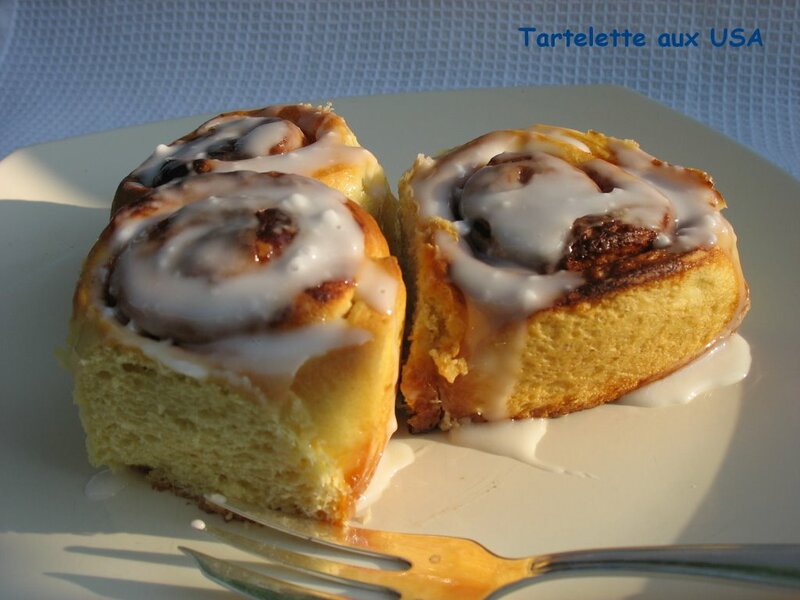 They are used sweet or salty, filled, caramelized or left hollow. I have one prefered recipe for chouquettes but it makes a giant amount (I use it for catering) and a big stand mixer, even a full class a hungry students did not justify it so I visited one of my favorite blogs, Cindy's kitchen and found an excellent one. Never fails. Chouquettes (makes about 36 small ones). Start with a basic choux pastry. Boil water, sugar and butter. Remove from heat and add flour at once, return to heat and stir continuousl with a wooden spoon to make a smooth shiny paste. Cool a few minutes. Beat the eggs in one at a time until shiny and smooth ( about the consistency of thick mayonnaise). Form the choux on a parchment paper lined baking sheet, sprinkle with some coarse sugar (I did not have any but I had some coarse brown sugar crystals). Bake at 350 for about 20 minutes. Mr. B. only brought 6 back so guess what we are having tonigh for dessert? Profiteroles! Choux , ice cream and chocolate sauce...we are truly lucky! We are spending a lovely lazy sunday, enjoying a cool breeze but Tippy is sending me a message: "Time to put on your running shoes girlfriend!". Not food post today, the dog needs my undivided attention. Head over to Sweetnicks to see this weekend's roundup. 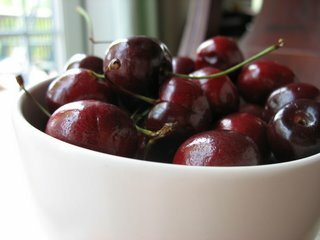 It's summer, it's hot, I live in my underwear, I read Epicurus, and I swoon over fresh cherries. If you already know me, you already know that, if not...welcome to my food world. The way I eat is the way I love, the way I love is the way I eat: fresh, honest, bold and in abundance. Here is an other secret of mine: you can "have" me with a bowl of fresh dark red cherries. Another rainy afternoon here. It is unbelievably hot throughout the day with bright blue skies above and when 4 o'clock rolls around so do the thunder, lightning and rain. The wind picks up, the clouds break in and it pours. Just enough time to bake and take a picture. I felt like baking one of my comfort childhood snacks. 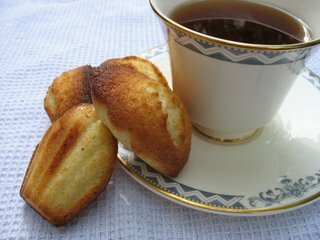 My mom used to by them packaged from the store but once you have tasted homemade madeleines there is no going back. A couple of years ago, my mom gave me this book at Christmas and I have made only a couple of the madeleines recipes in it. I have vowed to bake my way through the book, a couple of madeleines a week. 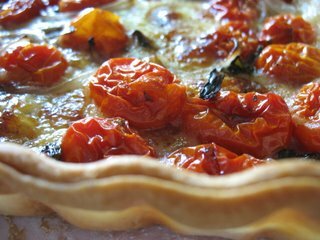 The book is organized by season and month so as to make the best use of seasonal produce but nowadays items seem to be available year round (at least here in the US), which leaves you with complete baking freedom. History behind these madeleines: in 1755, the pastry chef of Stanislas Leszczynski quit his job in the middle of the dinner service, taking with him all his cakes and pastries as well as the recipes. A young maid voluntered to bake the little cakes her grandmother used to make. This young maid named Madeleine, from Commercy, apparently saved the day! Preheat oven to 500 degrees. Melt the butter either in the microwave or in a saucepan on low heat. Let it cool a bit. In the bowl of an electric mixer, whip the eggs and the sugar until pale yellow. Add the flour and baking powder. Mix on medium high speed until everything is well incorporated, add the melted butter. Pour one Tb. of the batter into the center of madeleine molds (I use silicone ones). Bake in the center of your oven for 4 minutes at 500, then lower the temperature to 400 and bake another 4 minutes. Unmold as soon as they come out of the oven. These are great with everything: jam, nutella, ganache, tea, coffe, milk....heaven! You have probably figured out that I am all for food recycling. Well after Sunday Party, I had a load of mini grape tomatoes and mozarella kebabs left over, so I unrolled a sheet of pie crust (please don't tell Martha) and got to work. I marinated the tomatoes and mozarella in 1 Tb. olive oil, 1 Tb. balsamic vinegar and added one sliced vidalia onion, some black pepperput the mixture in the pie crust and let it bake at 350 for 45 minutes. It was great and easy dish with a side salad and scorching hot temperatures outside. Here is my "to go/ no fuss/ never failed me" fresh fruit tart recipe. Let me explain: when I was working full time at the restaurant, there were many a Saturday mornings that started with a light hangover, yes restaurant crews are known to enjoy the night life and then some... When you are faced with a busy weekend ahead, a headache and a load of creme brulees, nougat glace, chocolate mousses, apple tatins, cheesecake and others, a good fresh fruit tart has the tendency to be put at the bottom of your to do list, and it is quite a shame because a good fruit tart is just that: goooooood. It should be uncomplicated so as to put forth the freshness of the fruit yet interesting and bold in flavors so as to attract diners and gourmands. I don't know exactly how I came up with this one, after years of baking and reading magazines, cookbooks, one can develop, mix and match their own recipes and I am probably sure I came up with this one on one of my morning jogs (probably trying to sweat out some cosmos after a night out). Long story short, you can use this recipe for every sort of fruit available. 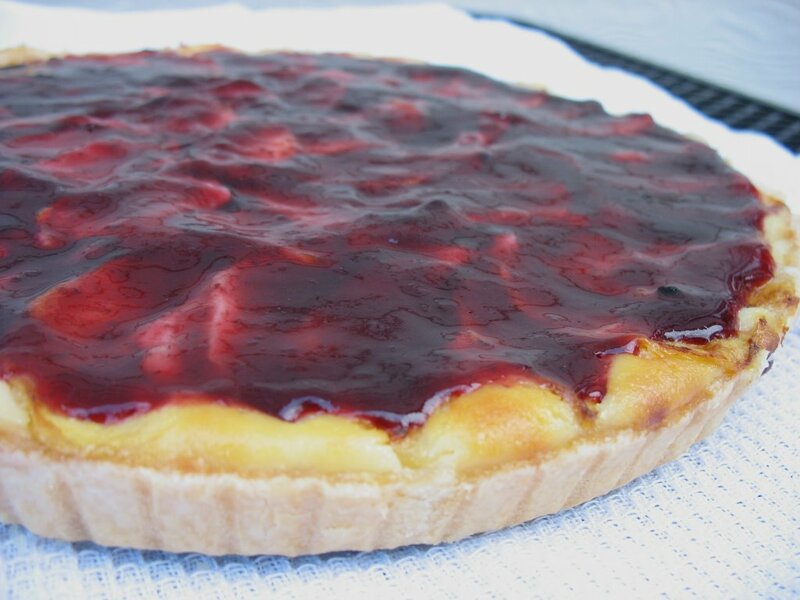 You can bake the layer of fruit on top of the tart with the filling, or lay unbaked ones once the ricotta mixture has cooked and cooled and the glaze on top can be made with any flavor of jam or jelly you enjoy. It is so incredibly versatile. Pre bake the tart shell at 350 for about 10 - 15 minutes. While it cools a bit, pour the ricotta in a big bowl, add the sugar, lemon juice and zest. Mix well. Add the eggs and whip until fully incorporated. Layer the fruit on top and bake for about 45 minutes or until almost set (the center will still wiggle a bit, but will firm up in the fridge). Let the pie cool down for 30 minutes and pour the heated jelly on top. Refrigerate until completely cooled. If you want to use fruits like kiwis or fresh berries, you can bake the ricotta filling first, let it cool completely and then layer the fruits on top, ending with a glaze like apricot, apple or orange jelly. We have forked through 1/2 of it already..... I think the neighbors won't get to try this one either...Sorry!